The new textile policy announced by the Government will give a major breakthrough to one of the promising sectors of the Indian economy. Indian textile is a significant foreign exchange earner for the country. India exports textiles of diverse kinds. These include natural, regenerated cellulose and synthetic fibres. Despite competition from low cost suppliers like Bangladesh, China and Pakistan, textile exports performed well during the recent years. Positive mood of the industry following the large scale big bang reforms by the Government is expected to give a fillip to investments and employment in the sector. The textiles industry in India is currently estimated at more than US$ 100 billion. It is the second largest employer after agriculture, providing employment to over 45 million people directly and 60 million people indirectly. These include manufacturers, suppliers, wholesalers and exporters of Cotton Textiles, Handlooms, Woollen Textiles as well as those engaged in the manufacturing of textile machinery and equipment, dyes and raw materials, delivery of finished textiles, fabrics and garments. While yarn is mostly produced in the mills, fabrics are produced in the powerloom and handloom sectors. The textile industry indirectly contributes around 5 per cent to GDP. The sector contributes around 14 per cent to the overall Index of Industrial Production (IIP). Around 60 percent of India’s textile industry is cotton based and India is the second largest producer of fiber in the world. The other major fibre produced are silk, jute, wool, and man-made fibres. The Indian textile industry has a rich past. References are found in Vedic Literature not only about the manufacturing but also the trade at large. History depicts that India’s manufacturing technology was amongst the best in the World. India’s manually operated textile machines were among the best in the world prior to colonization. India’s machines and technology served as a model for production of the early textile machines in newly industrialized countries such as Britain and Germany. Textile industry in India is vertically integrated from raw material to finished products which are fibre to retail. Government of India has been providing liberal assistance to the sector under the various programmes such as Technology Upgradation Fund Scheme (TUFS). Since the inception of TUFS, investment of more than Rs. 2,50,000 crore has been made till 31 March 2014 in the sector and Rs 18,579.40 crore has been released towards subsidy. It has been envisaged since the start of the new century that Indian textile industry has been showing an increasing trend. The exports have shot up from just USD 10.52 billion to USD 38.53 billion, showing a growth of 266.25% (from 1999-00 to 2014-15). This shows a boom in the Indian textile industry. The Government has announced a slew of measures which are labour friendly and would enhance production possibility frontiers, promote employment creation, economies of large scale and boost export growth. The move comes in the backdrop of the package of reforms announced by the Government. These reforms are expected to generate a large number of new employment opportunities and attract investments in the tune of Rs. 74,000 crores in the next 3 years. Employee Provident Fund Scheme Reforms - Govt. of India shall bear the entire 12 percent of the employers’ contribution of the Employers Provident Fund Scheme for new employees of garment industry for first 3 years who are earning less than Rs. 15,000 per month. At present, 8.33 percent of employer’s contribution is already being provided by Government under Pradhan Mantri Rozgar Protsahan Yojana (PMRPY). Ministry of Textiles shall provide additional 3.67percent of the employer’s contribution amounting to Rs. 1,170 crores over next 3 years. EPF shall be made optional for employees earning less than Rs. 15,000 per month. This shall leave more money in the hands of the workers and also promote employment in the formal sector. 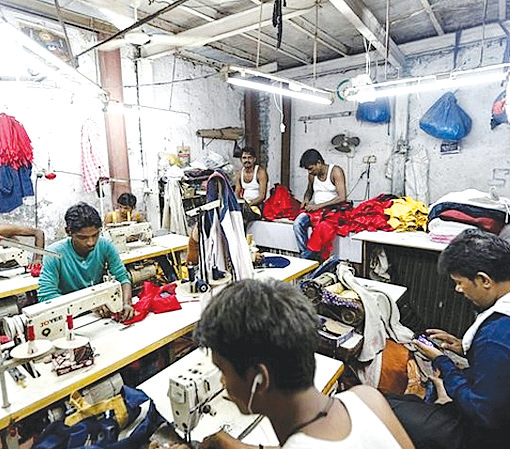 Introduction of fixed term employment- Looking to the seasonal nature of the industry, fixed term employment shall be introduced for the garment sector. A fixed term workman will be considered at par with permanent workman in terms of working hours, wages, allowanced and other statutory dues. Additional incentives under ATUFS- The package breaks new ground in moving from input to outcome based incentives by increasing subsidy under Amended-TUFS from 15 to 25 percent for the garment sector as a boost to employment generation. A unique feature of the scheme will be to disburse the subsidy only after the expected jobs are created. Enhancing scope of Section 80JJAA of Income Tax Act - Looking at the seasonal nature of garment industry, the provision of 240 days under Section 80JJAA of Income Tax Act would be relaxed to 150 days for garment industry. Endowed with inherent advantages of an assured supply of raw materials and human skills, the big bang facilitation to the industry is going to push radical changes in terms of upgrading technology at par with the world. Investments in the core sector and modernization of the industry will increase its competitiveness in the international market and increase production, exports and employment of the country. An increasing number of units will enter in the value additions to meet the needs of the global market. The reforms will help the industry to become globally competitive, not only in terms of price but also in quality as the measures undertaken will remove some of the major bottlenecks that were pulling back the industry for a long period of time. The results would become visible with the growth of investments, employment and exports in the coming times. The inclusion of State-level taxes in the computation of duty drawback is a significant breakthrough for the manufacturers and exporters. It has addressed a long-standing demand of the industry. The enhanced 10 per cent additional TUFS subsidy for the garment sector will encourage sector to adopt state of the art infrastructure, modernise and augment production besides creating additional employment opportunities for youth. The relaxation in minimum number of days requirement under Section 80JJAA from 240 days to 150 days is an excellent win-win situation for both exporters and labour force as manufacturers/exporters are sometimes required to engage labour to meet the seasonal demands. Further, the exemption from employees’ contribution for those who are drawing wages up to Rs. 15,000 and contribution by the government in lieu of employer will facilitate workers shift from unorganized to organized sector thereby entitling them for the various benefits extended by the government aimed at labour welfare. Generating the formal and productive employment in India is the need of the hour. Large chunk of investments in prospective and promising sectors of the economy would expand production possibility frontiers and generate employment. The textile and apparel sector is one of the promising and prospective sectors of the Indian economy, considered as an excellent vehicle for an employment creation strategy with strong macroeconomic impact. Approval to a number of measures to boost the textile sector is therefore a significant policy breakthrough. It can be used as an opportunity to promote textiles and apparel exports vis-à-vis rising wage levels in China. The time is most opportune for India to take advantage of China’s decelerating competitiveness in the international market as wage costs are comparatively low in most of the Indian States. However, some other Asian economies like Bangladesh, Thailand and Vietnam are also competing and becoming successful in the international market. So we have to move fast to regain the lost competitiveness in the international market. At the domestic front, we need to increase our productivity to become competitive, so the flexible labour reforms would be crucial for the sector as the industry is highly labour intensive. Further, India is paying a heavy duty to access the advanced economies markets where no free trade agreement is signed with the destination economies. So to gain access in those markets, we need to focus on signing the free trade agreements to move forward.